Students are engaged to consider the challenges faced by people in wheelchairs and develop remedial strategies following engineering design. While modern building designs follow specific regulations to provide safe accessibility to wheelchairs, many older neighborhoods still contain designs inaccessible and dangerous for people in wheelchairs. For example, many ramp designs have slopes too large or lengths too short to safely stop a rolling wheelchair. Therefore, students are challenged to design accessible ramps using common rocks and minerals to modify ramp surfaces that can safely and efficiently stop wheelchairs. In completing the design challenge, students will demonstrate understanding of mathematical relationships between speed and motion and differentiation of potential and kinetic energy. By maintaining an Engineering Log, students will also develop skills in writing quantitative ideas and evidence-based argument. Grandpa’s house is in a historic neighborhood with strict local building codes regarding front porches of houses. The neighborhood association is currently accepting proposals for handicap accessible ramps that will fit within their strict aesthetic guidelines. 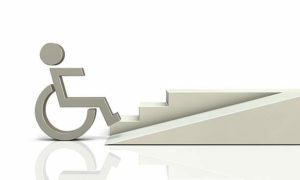 Although grandpa’s ramp does not comply with ADA (American with Disabilities Act) guidelines for handicap accessible ramps because it is located within a private residence, it is possible to modify the ramp provided that a wheelchair will not reach an unsafe speed while traveling down the ramp. Your team must use natural rock and mineral materials for modifying grandpa’s ramp. Also, you may not intervene with the wheelchair in any way to create a braking effect on the wheelchair when demonstrating your team’s design. Will your team be able to hold grandpa up without letting him down? Browse the Stem Curriculum archive. Grade Level: 6. Content Area: Expressions and Equations, Key Ideas and Details, Physical Science, Visual Arts, Writing. Industry: Advanced Manufacturing and Materials, Civil Engineering. Bookmark the permalink.